Ethereal’s second-generation HDM-GA2 Gigabit Accelerator transforms existing hard-wired passive HDMI cables by expanding their bandwidth capability to 24Gbps for up to 15.5 meters, with support for every feature set under HDMI 2.0b, and up to 9+ meters for the 48 Gbps format. This low-profile product is easy to mount behind the display system. 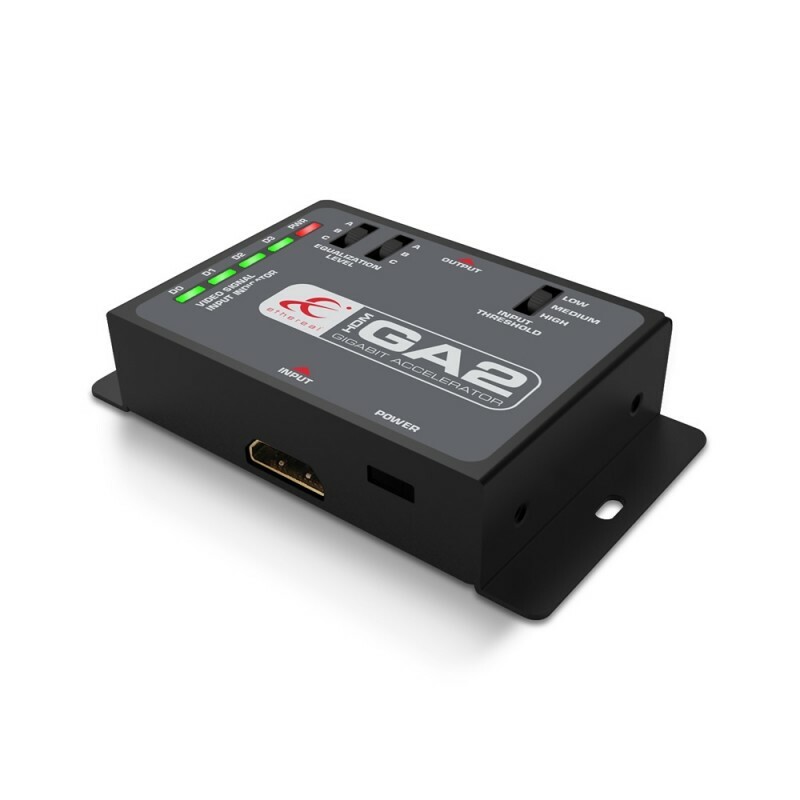 The HDM-GA2 is designed to be used only with passive HDMI cables and is intended to be installed at the display side of the system. It has the flexibility of adjusting to different cables and gauges. The result is an upgraded home theater system with a higher output resolution and bandwidth content for 4K, 8K and beyond, achievable with the simple installation of a device smaller than the palm of your hand. The HDM-GA2 has the latest in High-Speed Digital Audio and Video restoration to support any and everything that you can throw at it. It includes the new DDC data integrity circuitry to fix what ails your EDID Low-Speed Data. Combine all of these into one very small, easy-to-install package and you have the best long-distance HDMI cable restorer available anywhere. The HDM-GA2 is the only solution to conquer this distance for 4K, 8K and HDR at these extended distances. The HDM-GA2 circuitry is fully self-contained, internally biased, independently powered, internally amplified, totally isolated from the HDMI bus, and from a system standpoint is completely quarantined between both the sink and source devices.